March 25, 2019 | Bob Boilen -- I had a surprise for Chill Moody when he arrived at the Tiny Desk: a concealed strawberry shortcake (his favorite) for his 34th birthday. His musical partners, singer Donn T and the rest of his Philly crew known as &More, all brought out the cake and candles, sharing in the celebration. It was a fitting moment to have between the group's performance of inspirational songs. &More's music is often about the experience of being black in America, blending hip-hop and R&B with a motivational message and a Philadelphia flair. The three songs they played are from their debut album Ethyl Bobcat, coming out on April 5. I first discovered &More while sifting through hundreds of Tiny Desk Contest video entries last year. 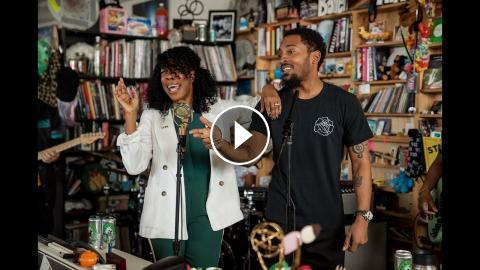 Their standout video was for a song called "WHOA," which is also the third song they played during their visit to the Tiny Desk. It's a song that expresses exasperation at current events, when words just can't be found, and when all one can say is, "whoa!" But despite the intensity of the subject matter, much of what &More, Donn T and Chill Moody play stays positive. You can hear it in the refrain of the song: "The hate you give, won't stop and let you think; the love you save keeps you on the brink." The positivity is infectious.